7 August 2018 marks the 10th year since Russia’s large-scale military invasion in Georgia and the following illegal occupation of Georgia’s indivisible regions of Abkhazia and Tskhinvali region/South Ossetia. Through its military aggression against the sovereign state and further illegal steps, Russia blatantly violated the fundamental norms and principles of international law and created a dangerous precedence of attacking the rules-based international order. Russia’s actions in 2008 served the ambition to redraw the borders in Europe by force and undermine the entire European security architecture. A decade later Russia still continues the aggression against Georgia. The 1-15 August large-scale military drills in the occupied territories with involvement of thousands of Russian troops and hundreds of military equipment, represent an unprecedented attempt by Russia to demonstrate its military power, that at the same time qualifies as a use of force and threat by use of force against Georgia. 10 years since the Russia-Georgia war the Russian Federation has not implemented the EU mediated 12 August 2008 Ceasefire Agreement and continues violating its international obligations, despite constant calls from the international community. In full disregard for the Ceasefire Agreement that obliged Russia to withdraw its forces from the territory of Georgia, Moscow has further reinforced its illegal military presence on the ground and continues to hinder the establishment of international security arrangements in Abkhazia and Tskhinvali regions of Georgia. 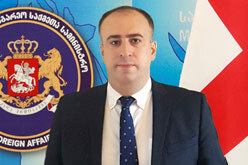 The Ministry of Foreign Affairs of Georgia expresses its great concern that the security and human rights situation in the occupied territories has been further deteriorated. Continuous fortification of the occupation line through installation of barbed wire fences and other artificial barriers as well as constant kidnappings and illegal detentions by Russian FSB personnel further destabilize the security environment on the ground. As a result of this illegal process many families were left divided, many lost access to their agricultural lands, religious site and cemeteries. The grave human rights infringements in both in Abkhazia and Tskhinvali regions include but are not limited to gross violations of rights to freedom of movement, residence and property, as well as prohibition of education in native Georgian language, that have made lives of the local population unbearable. While hundreds of thousands of IDPs and refugees, expelled from their homes as a result of several waves of ethnic cleansing, are still deprived of right to the safe and dignified return, those Georgians who remained in the occupied territories continue to be a subject of intensified ethnic discrimination. The recent cases of illegal deprivation of life of three Georgian IDPs – Davit Basharuli, Giga Otkhozoria, and Archil Tatunashvili vividly demonstrate the impunity and ethnically driven violence in both occupied territories. In response to the constant provocative steps, Georgia stays committed to its peaceful conflict resolution agenda. Georgia has spared no effort to fully utilize the peace negotiations in the frames of the Geneva International Discussions as well as Incident Prevention and Response Mechanisms to dully address security and humanitarian problems of conflict-affected population stemming from the unresolved conflict between Georgia and Russia. Remaining in full compliance with the EU mediated 12 August 2008 Ceasefire Agreement, Georgia has many times unilaterally reaffirmed and implemented the non-use of force commitment, still awaiting the reciprocity from Russian side. At the same time, Georgia has intensified the efforts towards engagement and reconciliation between the communities divided by war and occupation lines. For that purpose the Government of Georgia has introduced the new peace initiative “A Step to a Better Future” directed to improve humanitarian and socio-economic conditions of people in Abkhazia and Tskhinvali regions and foster people-to-people contacts and confidence building between the divided societies. The Ministry of Foreign Affairs of Georgia highly values the unwavering support of the international society to the sovereignty and territorial integrity of Georgia, as well as the peaceful conflict resolution process. The Georgian side appeals to the calls upon the international community to further consolidate the efforts in responding the consequences of the August 2008 war and the peaceful resolution of the conflict in Georgia in compliance with the international law. The Ministry of Foreign Affairs of Georgia once again calls on the Russian Federation to cease its illegal actions on the territory of Georgia and comply with its international obligations, in particular to reverse the decision on recognition of so-called independence of Georgia’s occupied regions and fully implement the EU mediated 12 August 2008 Ceasefire Agreement. The Ministry of Foreign Affairs of Georgia would like to use this opportunity and express its deepest sympathy to the families and relatives of the soldiers and civil population who fell victim to the August 2008 war.